On Tuesday December 19, 2017, the Rockville Rams visited Whitman for our second home match of the year. The Rams snuck by us last year by a score of 32-42 but things were going to be very different this year. As the Vikings entered the gym to the throbbing beat of the 300 Violin Orchestra they were visibly pumped up and ready to settle the score. Several former Whitman Varsity grapplers, home from college on Christmas Break, were there to cheer on their former teammates. These alumni included Max Sessions (2014), Christopher Boinis (2015), Marcos Solloso (2016), Mitch Fenton (2016), Chris Habibian (2016) and James Bamberger (2016). The contest started at 195 with Yussef Zaki who pinned his opponent in the first 24 seconds. Next up was Tom Wilmarth at 220 who followed suit and pinned his opponent in 16 seconds. Way to go Yussef and Tom with two fantastic pins in the opening seconds of your matches! Ben Mickum was penciled in at 285 and wrestled the first period to a 0-0 draw before getting caught in 2nd period and pinned. This brought the score to 12-6. 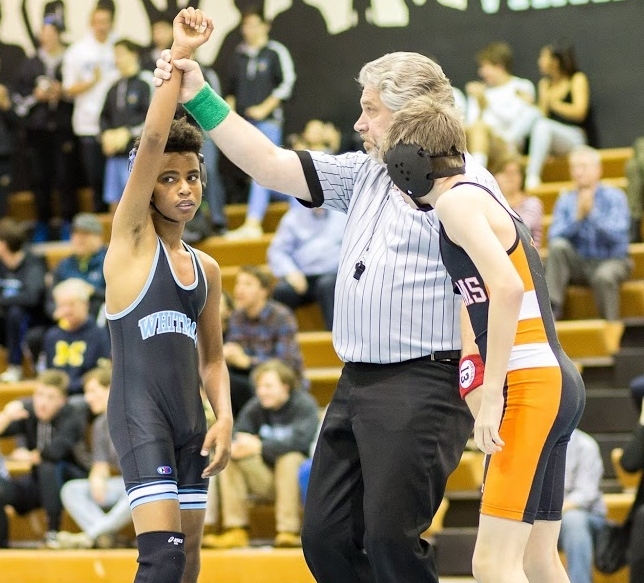 Up next, wrestling his first varsity match was freshman Isaac Beserat at 106. Isaac bested his opponent with an impressive pin in the first period, (great way to start your Varsity career, Isaac). 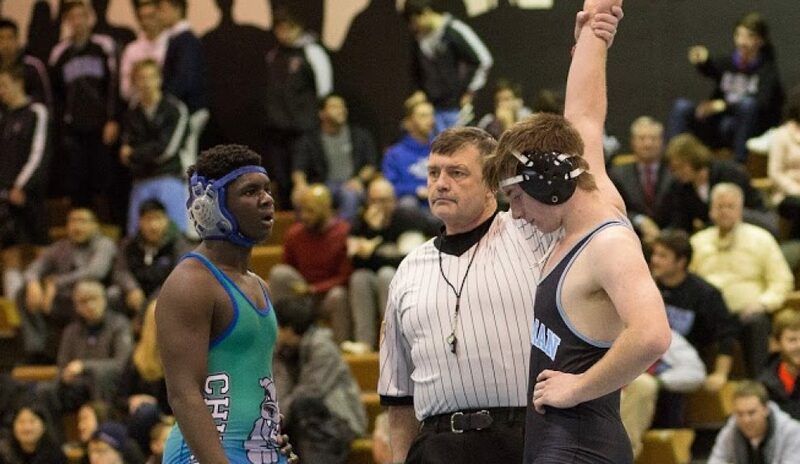 Sean Fleming then took a forfeit at 113 and Caleb Brenner pinned his opponent in the first period extending Whitman’s lead to 30-6. Great match Caleb! Next up was Peyton Casamento facing Nate Eig who was coming off a 9-0 run and first place finish over the weekend at the Parkside Holiday Tournament in Salisbury, Maryland. Peyton had no problem with Eig and ended up with a Major victory winning 9-0. Matthew Lindstrom followed at 132 and showed why he deserves to be in the Varsity lineup this year with a third period pin. Next up was Clark Boinis at 138, who like Peyton, was facing an opponent (Tito Nunez) who was also coming off a 9-0 run and first place finish over the weekend at the Parkside Holiday Tournament. Clark dominated his opponent and carded a Technical Fall in the second period pushing Whitman’s lead to 45-6. Unfortunately the Vikings dropped the next two matches at 145 and 152. It was not until Sang Hanna stepped on the mat at 160 that Whitman scored again, with Sang winning a close 9-8 decision. Whitman then lost the 170 match but Jack Ryan showed true grit and refused to be pinned and carried the contest to the end. The last match of the evening was left to Sophomore Sebastian Turkewitz at 182. This was Seb’s first Varsity match of the year and he came through for the team with a pin in the 3rd period after leading 3-1 in the second. This concluded the contest with Whitman dominating the Rams with a final score of 54 to 22. The JV wrestlers also had a good showing, besting Rockville with 4 pins by Logan Glazier, Will McDonald, Jay Gatten and Danylo Hartzler with a final score of 24-12.